Beta alanine is classified as a non essential amino acid and is the one and only naturally occurring beta type of amino acid. 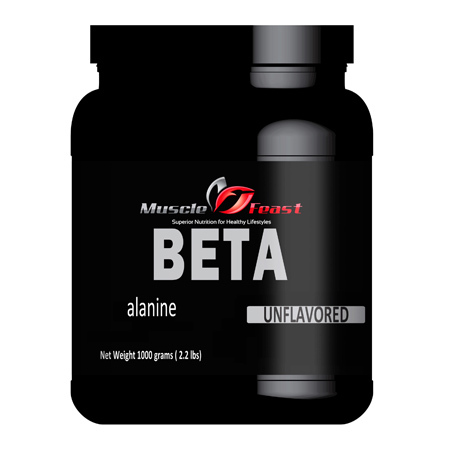 Unlike the regular amino acid alanine, beta alanine is not considered a building block of protein. The most natural way to get your beta alanine is through eating protein rich foods such as red meats, chicken, pork and seafood. With literally hundreds of different supplements available and so many that are based on bogus claims and ridiculous hype, it’s a challenge to find even one that delivers results. If you’ve rummaged through the garbage of the supplement scrap heap, you know how difficult it is to find solid science or real-world proof. Beta-alanine is an exception. This supplement actually lives up to its claims. Beta-alanine efficacy is backed by major university, peer-reviewed studies performed on humans, not the typical cell or rat studies upon which many generally base claims. The science behind beta-alanine makes sense and it works. Used properly, beta-alanine can take your training and results to new levels, helping you set personal records and add lean mass. Although only recently brought to the forefront, beta-alanine was discovered over 100 years ago. Also known as 3-aminopropanoic acid, it is a non-essential amino acid and is the only naturally occurring beta-amino acid. Not to be confused with alanine, beta- alanine is classified as a non-proteinogenic amino acid as it is not used in the building of proteins. The greatest natural dietary sources of beta-alanine are believed to be obtained through ingesting the beta-alanine containing dipeptides: carnosine, anserine and balenine, rather than directly ingesting beta-alanine. These dipeptides are commonly found in protein rich foods such as chicken, beef, pork and fish. However, obtaining beta-alanine through these dipeptides is not the only way, as our bodies can synthesize it in the liver from the catabolism of pyrimidine nucleotides which are broken down into uracil and thymine and then metabolized into beta-alanine and B-aminoisobutyrate. Of course, it can also be ingested through direct supplementation which is the focus of this article. Beta Alanine may be the best muscle building supplement to use during your workouts. Beta Alanine has the ability to buffer lactic acid buildup so that the PH level in your muscle stays in a range where the muscle can continue working. What does this mean? It means you can crank out a few extra reps and push your muscles harder. The greatest thing about Beta Alanine is that it’s so effective. Many supplements a person can take aren’t very bio-available, meaning that the body doesn’t absorb and utilize them very well. But Beta Alanine is the exact opposite. Studies have shown that supplementing with Beta Alanine can raise Carnosine levels in muscle tissue by up to 65%. That’s incredible, especially if you know anything about supplements. I’ve never studied another supplement that has that much effect inside the body. And the greatest thing about Beta Alanine is that it’s a natural amino acid, and doesn’t come with a wide range of side effects like a lot of other muscle enhancing drugs. The support of high caliber researchers speaks volumes about the efficacy of beta-alanine and the science itself is even more impressive. Much of beta-alanine’s effects are realized by boosting the synthesis of carnosine, a dipeptide (two amino acids) intracellular (inside the cell) buffer. To understand how beta-alanine works, you must first understand its connection to carnosine. It is by boosting carnosine levels that beta-alanine exerts its performance benefits. The Russian scientist Gulewitsch was the first to identify carnosine in 1900. Eleven years later, he would discover and identify its constituent amino acids, beta-alanine and histidine. Seven years later, Barger and Tutin and Baumann and Ingvaldsen confirmed Gulewitsch’s findings. However, it wasn’t until 1938 that the first research on carnosine and its effects on muscle buffering were published. Carnosine is found in both type 1 and type 2 muscle fibers, though in significantly higher concentrations in type 2 fibers (the fibers we primarily use in high intensity strength workouts and which are most responsive to growth). Before we discuss how carnosine works, you must first have a general understanding of what is physiologically occurring during exercise. Specifically, what is negatively affecting muscular pH, making us weaker and causing fatigue? Hydrogen Ions are Released During Exercise, Causing Performance to Plummet. When we exercise, especially when it’s high intensity exercise, our bodies accumulate a large amount of hydrogen ions (H+), causing our muscles’ pH to drop (become more acidic). This process is occurring whether you feel a burn or not. The breakdown of ATP and the subsequent rise in H+ concentrations occur in all of our energy systems but H+ buildup is most prevalent in an energy system called glycolysis, which also produces lactic acid. At physiological pH, lactic acid dissociates H+ and is the primary source of released H+ ions during exercise, causing pH to drop. It is the released H+ from lactic acid that causes muscular performance problems, not the leftover lactate ions as many incorrectly believe. While lactic acid is the primary source of released H+, it is not the only source. H+ ions are also being released at a rapid rate when you break down the high energy compound ATP during exercise. With the presence of many sources during energy production releasing H+, pH quickly drops as does muscular performance, slowing progress and lean muscle gains. There are a handful of ways carnosine is thought to impact performance but its most studied function, and the focus of this article, is its role as an intracellular buffer. Carnosine helps stabilize muscular pH by soaking up hydrogen ions (H+) that are released at an accelerated rate during exercise. Our bodies work to keep our pH in balance by utilizing various buffering systems. Buffers largely work by soaking up H+ to maintain optimal pH balance, which we need to function most effectively. As mentioned above, our muscles function best in a specific pH range. When pH drops below that range, so does muscular performance. By helping to keep us in a more optimal pH range, our muscles can continue to contract forcibly for a longer time. There are a handful of buffering systems that work in our bodies. Some maintain pH in extra cellular fluids (ECF) outside of the cell, while others perform their duties in intracellular fluids (ICF) inside the cell and some perform in both. The first line of defense in absorbing the H+ is going to be the cell from intracellular buffers such as carnosine, not from extra cellular buffers. Aside from carnosine being just where we need it, buffering H+ inside our cells, it has additional, unique attributes that make it really shine. Carnosine is unique; in that, other natural buffering systems our bodies use are also used in many other cellular reactions aside from buffering, watering down much of their buffering abilities. However, what makes carnosine really exciting, is that by supplementing with extra beta-alanine, we can specifically and dramatically increase carnosine levels. Supplementing with beta-alanine for just 4 weeks, can increase carnosine concentration by 42-65%. Longer beta-alanine studies going up to 10-12 weeks, show carnosine concentrations increased up to 80%. This is a tremendous increase in an already powerful intracellular buffer. It is this large increase in buffering capacity within our muscles that is largely responsible for the strength, lean body mass, power and muscular endurance gains that researchers are seeing from beta-alanine studies. Research has shown that you can take an amount between 3.2 grams and 6.4 grams per day to significantly boost carnosine levels and improve performance or as directed by your physician. Mix for 20-30 seconds using a shaker cup or mix thoroughly with a spoon. May not mix very easily. May be hygroscopic and may clump during shipment. This does not affect the efficacy of the product; just the texture. Try mixing in sport drink or anything with a ph less than water to improve mixability. It may be necessary to let it sit for awhile. Beta alanine is a very safe supplement but does have some possible side effects such as a mild tingling sensations and skin flushing. These side effects are typically felt in the extremities such as the arms, hands and feet. These side effects of beta alanine are for the most part temporary and tend to diminish the longer you take the supplement. If you continue to experience these side effects you should experiment with lowering the dosage. As with any supplement it is important to understand the possible benefits and risks, and it is for this reason you should always consult your doctor prior to starting. For the majority of users beta alanine will be a real benefit to their workouts and will give them little to no problems. Shelf Life: This product will retain a 2 year shelf life from the date of manufacturer if properly sealed and stored in a dry, cool environment outside of direct sunlight. We guarantee our supplements to be the freshest and purest available: Muscle Feast, LLC supplements are manufactured under the strictest HACCP, FDA, and Kosher standards, producing the highest quality and purest supplements available. Our raw ingredients undergo state of the art analysis to ensure zero impurities and strict adherence to product labeling. When it comes to price and quality you can’t beat Muscle Feast. We guarantee it! FREE dosing scoop: Get the exact dosage every time with a free single-dose scoop. Fill to the top, not the line. How can our Quality be so high and our prices so low? We are able to keep our pricing so low because we are a relatively small manufacturer with very low overhead and we sell direct to the public. We source the same great suppliers used by more popular brands.